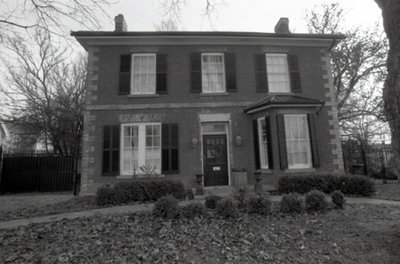 A black and white photograph of 407 Colborne Street. View is of the front of the house. This brick house was built in the late 1850s or early 1860s at the south east corner of Colborne and Henry Streets for Roderick Ross (1815-1884). Roderick Ross was a Scottish contractor. After his death, the house was occupied by his son, Hugh, a Whitby dry goods dealer. This house is located at 407 Colborne Street West in Whitby. 407 Colborne Street, c.2006, Carl Ferencz. Whitby Archives A2013_013_001.